I haven’t blogged in over a year, but have literally thought about it every day. 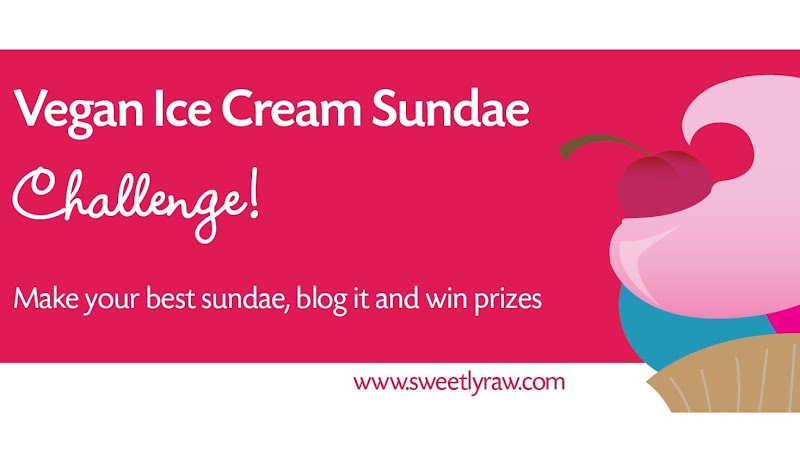 When I found out Heathy from sweetlyraw.com was doing another contest, I thought I should break the ice and begin blogging again and enter the Vegan Ice Cream Sundae Challenge. 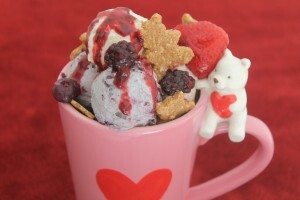 Since I haven’t blogged in so long, I wanted to make it a special one and in honor of my mother, I did the ice cream sundae theme about bears because she loves Teddy Bears. My mother has been very ill for the last year. She has been in and out of the hospital with atrial fibrillation, blocked kidney, and neck surgery. I will not draw out the details, but I want my mother to know that she is deeply loved “Beary” much by me and so many others. To make the “Beary” Berrilicious Sundae there are several steps to take. I started with the Graham Cracker Bears. They remind me of Teddy Grahams but so much healthier and pure. 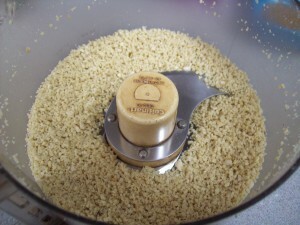 Place cashews into food processor, and make into flour by pulsing. 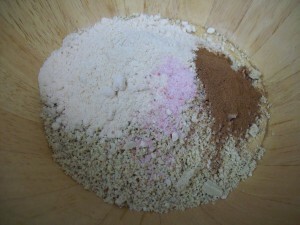 Pour into a bowl, and add coconut flour, salt and cinnamon, then mix until blended. Stir in the agave and vanilla. Blend all ingredients into ball. 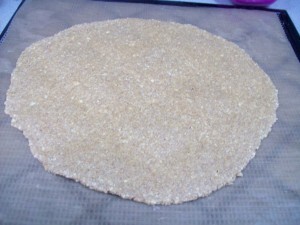 If the ball is too wet to pick up with your hands add some coconut flour until it becomes a pie/pizza crust consistency. 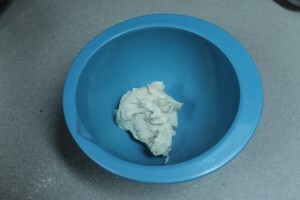 Place on either a Teflex Sheet or Parchment Paper, and use another sheet or paper to cover the dough ball. 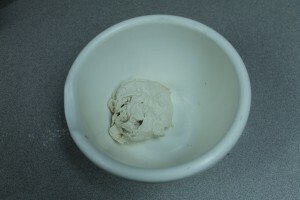 Flatten the dough ball and roll out to about a 1/4 inch thickness. 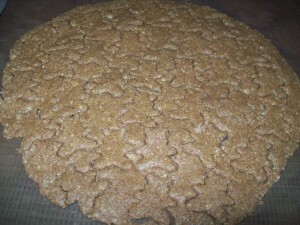 After pulling top sheet off you can then use the small bear cookie cutter to make the Graham Cracker Bears. When the bears are formed you can place them on a Teflex sheet for the dehydrator or a cookie sheet pan with Parchment Paper for the freezer. Dehydrate the bears on 115 degrees for 6-8 hours or freeze the bears. 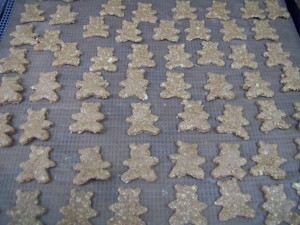 I dehydrated the bears and they were crispy after 6 hours, but once they sat out for a short time they softened. I placed them in the freezer in order to keep them crispy. After making the bears I started on ice cream base. 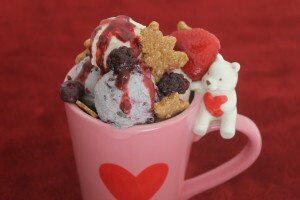 I used a Vanilla Ice Cream Base for the flavors for the “Beary” Berrilicious Sundae. 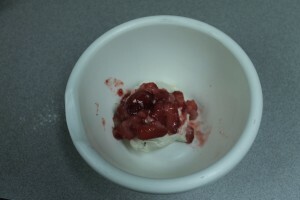 Place all ingredients in high powered blender then pour mixture into ice cream maker. Make according to directions. 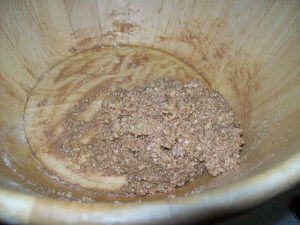 When the ice cream is finished, divide the mixture into 3 bowls. 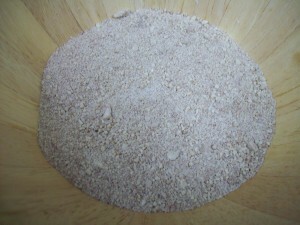 This base is used for the Straw”Beary” Ice Cream and the Mixed “Beary” Ice Cream. 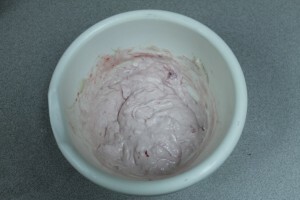 Mix strawberries and ice cream base together until the ice cream is pink and still has chunks of strawberries. 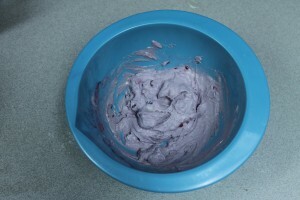 Mix until the color of the ice cream turns bluish purple and berry chunks remain. 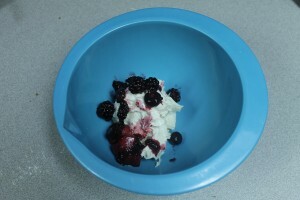 The third bowl will remain the plain Vanilla Ice Cream. 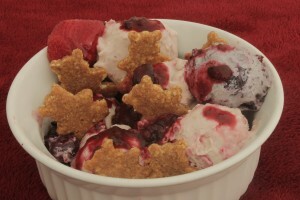 Now, introducing the “Beary” Berrilicious Sundae…. There was enough ice cream to make 2 sundaes. The sundaes are enough for 2-3 people per sundae. Cashew Vegan Ice Cream is always very filling to me because of the dense nutrient filled ingredients. So when you eat your “Beary” Berrilicious Sundae share it with someone you love and tell them how “BEARY” special they are to you. I LOVE YOU MAMA!! Posted 6 years, 8 months ago at 8:23 pm. Posted 8 years, 5 months ago at 2:39 pm. 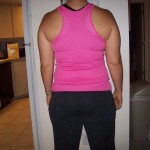 I was officially one of the winners of the Raw Food Muscle Challenge. Santiago picked 2 people instead of just one and I was one of them. I just talked to him on the phone on October 12. He gave me a workout and some tips for success. 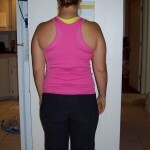 These include deep breathing exercises and some tips for eating. 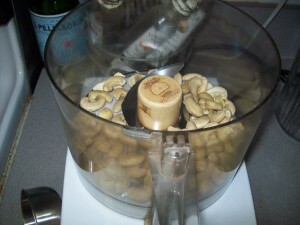 I definitely eat too many nuts and I am working on trying to find low fat raw recipes. I know for so long I have turned to food for comfort and Santiago addressed the issues. I am supposed to walk away from food and go outside if I feel like I am getting a craving. 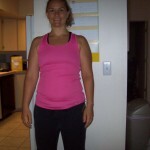 I am supposed to visualize myself as I want to look and feel in my body. Believe it or not it is working. I feel like when I do this, it gets me away from eating too much. I need to keep up with the consistency and keep visualizing. As for the workout, well I have to say it was hard, and I still feel sore in my upper body even though I did the workout 4 days ago!!! Maybe I over did it. Circuit training really works for me, it keeps things fun and my muscles guessing. I was supposed to go to the gym yesterday, but we had the football game and had to leave at 6:30 am then I went to Marsha’s house for the Raw Ladies Party. I have to say that I didn’t over indulge like I have in the past. My goals were definitely in my mind. Today I went biking and I still need to do my upper body workout. I may just start tomorrow because the gym is almost closed and I went for a longer bike ride then I planned. I do have weights here at my house, so I may pick those up and do the workout at home. I have this entire month to challenge myself and stick to what he tells me and I am hoping that the Visualizing will really help! Posted 8 years, 6 months ago at 4:35 pm. Posted 8 years, 6 months ago at 8:19 am. I haven’t written in a week, but I still have been truckin’ along with my raw food life! I am sitting here right now eating a collard wrap with fermented Chipotle Almond Cheese and loving every bite. 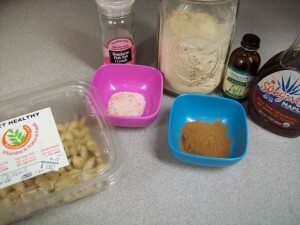 I have continued to eat mostly raw, there are some things that I ate that weren’t, such as, Ezekial Bread, Millet bread, hummus, and peanut butter. I have to be honest here, at first I thought I could do it with just all raw, but bread calls me, even though I know it makes me feel icky if I have too much. I wish I could find a raw version of bread that doesn’t taste like it’s turning to mold. It’s not even the taste I like, it’s more the “comfort” of it all. But collards are my new burrito shells. I have been experimenting in my kitchen so much lately. I am not into making too many desserts these days. I would rather get low glycemic ingredients. They just make me feel better. I haven’t posted this last week because it was my birthday, potluck and Jason’s birthday. I stayed on the raw path, but I ate such a variety of food that I was honestly lazy and didn’t write everything down. I have learned so much on this trip that I want to continue with as much raw as possible. I have been sticking to my workouts. I haven’t been doing as much exercise with weights this last week. I have been biking, walking and yoga. I went to my first yoga class of this year, last Friday. It gave me a jump start with my yoga practice again. I have been waking up in the morning to do the 5 Tibetan Rites. I received this video link through an email from the Raw Reform. I of course watched it and thought it would be good to start my day, and I did it once and now I am hooked. It makes me sweat in less than 5 minutes. It’s interesting that such low impact movement can do that, when I can spend 15 minutes on the elliptical at a fast pace and I still don’t start sweating. Yoga is amazing, and makes my spirit and body submerge as ONE! I love it for the grounding energy I feel. I appreciate my body more and really pay attention to it. I am looking forward to going tomorrow to the class again. I weighed myself today and honestly don’t feel like sharing the weight just yet, but I did lose 4 pounds. Jason measured me and my measurement did come down some. I would’ve liked to see more change, but hey, I know I have gained so much from this. I want to continue it forever! 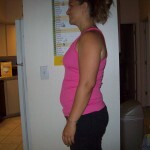 8/29/10 Left Leg: 26 inches, Hips 40 inches, Waist 36 inches, Chest 41 1/2 inches, Left Arm 14 inches. 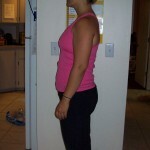 9/30/10 Left Leg: 25 1/2 inches, Hips 38 1/2 inches, Waist 36 inches, Chest 40 inches, Left Arm 13 1/2 inches. 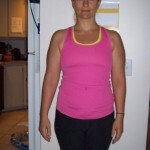 I don’t know how my waist didn’t come down some, ironic that, that is the measurement I was most worried about, because of Dr. Oz’s comment on his show about how the woman’s waist size should be less than 35 inches. After this month challenge I know I will continue to be fit and eat right. Another thing I learned is that I DON’T LIKE GOING TO THE GYM WITHOUT JASON! He took a few days off and I didn’t want to go without him. I need to get over that, but I am going gentle on myself and I am active almost everyday. One thing that I forgot when I learned about “RAW” is that exercise is as just as important as eating right. It took me a while to realize it again, but now that I am back getting “FIT”, I want to continue to exercise, eat right, spend time with God, and keep exploring my inner beauty. **I will post pics tomorrow. Thank you Santiago at The Raw Food Muscle for this wonderful challenge. I will continue to be inspired by you and your beautiful wife! Posted 8 years, 6 months ago at 8:50 pm. Posted 8 years, 7 months ago at 2:00 pm. No exercising yesterday. I felt so exhausted, so I slept most of the day. I slept while the boys played with the BB Gun and watched the Gator game. I can always take a nap when Jason’s home. It is the only time I feel I can rest. Today’s exercise was a bit of hoola hooping. I have missed it and didn’t get to the gym. I will start early tomorrow. I am looking forward to going back, I needed some time off. 2 green smoothies with banana, strawberries, Garden of Life Protein and spinach. Off to bed, I am ready to go read and relax. Posted 8 years, 7 months ago at 8:50 pm. Today I feel pretty drained and I feel that I have failed the raw food thing today:(. I will learn from my experience and not dwell on it. Ezekial bread and raw chocolate doesn’t really belong in my house, because it haunts me! Tomorrow is a new day. I feel that if I was doing this challenge with someone close by I would be doing better, but at least I am back in the swing of things with the eating raw and exercising. I didn’t exercise today and yesterday I rode my bike. I will relax tonight and do better tomorrow. I realize too that I need to eat less. I feel that if I ate meat I know I wouldn’t eat as much because I don’t like it at all and I love raw food, especially the desserts. I did make the best chocolate ever, my son LOVES it. 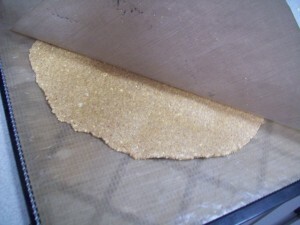 Stir and put into small parchment lined pan and freeze, it comes out like Taffy:) Oh my gosh, delicious! Posted 8 years, 7 months ago at 5:22 pm. I didn’t post yesterday, I meant to last night, but our rabbit was sick and we had to go to the emergency animal clinic last night at 11:00 pm. The bunny seems to be doing better, but we will see. He has head tilt, which is quite common, I guess. So he is on antibiotics and we are hand feeding him. He is drinking and eating quite well, so hopefully God will allow us a few more years with him. *Definitely not enough greens, too many sweets! *I took it easy today. It was beautiful outside so Jason and I played rball. It wasn’t much of a workout, but the stairs really kicked my booty:). I continue to make many sweet choices over what I should be eating, like salads or smoothies. I missed my green smoothie today and yesterday. Sometimes I just don’t want one. I have been craving juice lately, but I did spend some time in the kitchen today. I made several things to help me not eat things I shouldn’t, ie. bread. Bread is my weakness. I do feel like my head is cloudy since I ate the flour stuff this weekend. I should’ve used better judgement, even though there were wild edibles in the treats I ate, there were too many bad ingredients to make the recipe worth while. Oh well, I will know for next time. Off to sleep now. I am really tired, I was up too late to wake up as early as I did this morning. Tomorrow I will bike if the weather is good. Posted 8 years, 7 months ago at 9:39 pm. Smith Machine Squats 15 reps 10 lbs superset with 15 Pulldowns with 80 lbs. Leg Press with 10 lbs 25 reps superset with underhand pulldowns with 80 lbs. Front bar squats for 3 sets for 15 reps superset with 1 set step ups on bench(I was not feeling good by this time). One thing is for sure…I am dedicated to the gym. The eating part has always been difficult for me. But I feel like I am making progress by dedicating my time to the gym and not slacking there. Posted 8 years, 7 months ago at 9:13 pm.